There are a number of reasons for wanting to combine multiple depth cameras for simultaneous live capture of scenes. For one, arranging depth sensors in an inward-facing configuration will allow for the simultaneous capture of both the front and back of objects, so that the real-time, whole surface volumes of objects can be captured. This 3D recording can be used, for example, for Virtual- or Augmented-Reality “teleportation” and teleconferencing. Alternatively, arranging depth sensors in an outward-facing configuration will create a depth sensor system that has a much wider field-of-view (FOV), and can be used to capture both forward and backward facing depth. This composite FOV configuration is desirable for autonomous robots, drones and vehicles, as well as for security systems that need to continuously analyze a wide surrounding area. Approximate setup time – 4 hours. Download the white paper to read the full guide. Please check the latest Intel RealSense Firmware release that supports multiple HW synchronized Intel RealSense D415 depth cameras. 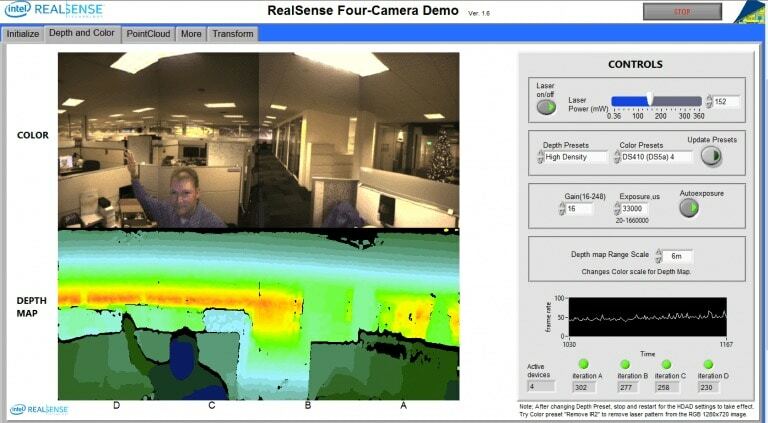 Buy Intel RealSense depth cameras.